The Philippines is set to celebrate one of its grandest and largest festivals on the 3rd Sunday of January 2018, the Sinulog Festival. 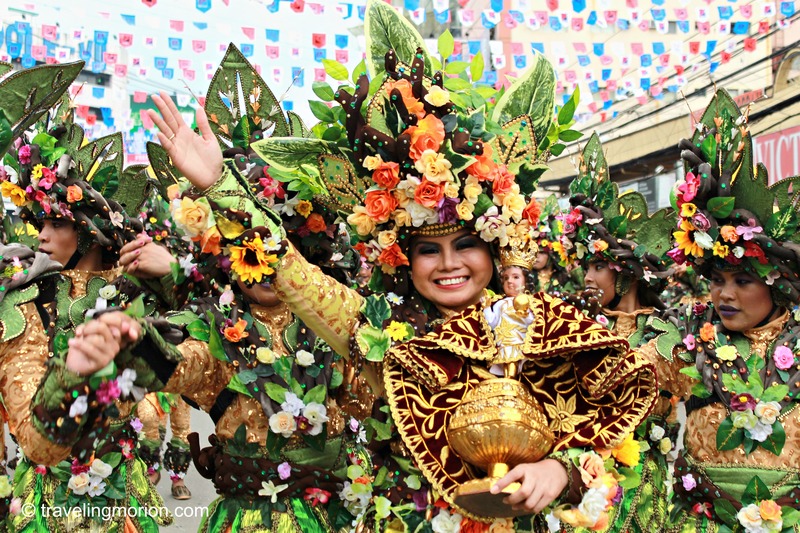 It is a celebration that pronounces the Cebuanos' cultural identity and religiosity. It's gonna be an exciting day of colors, tradition, pageantry, street party and the awaited Grand Parade. 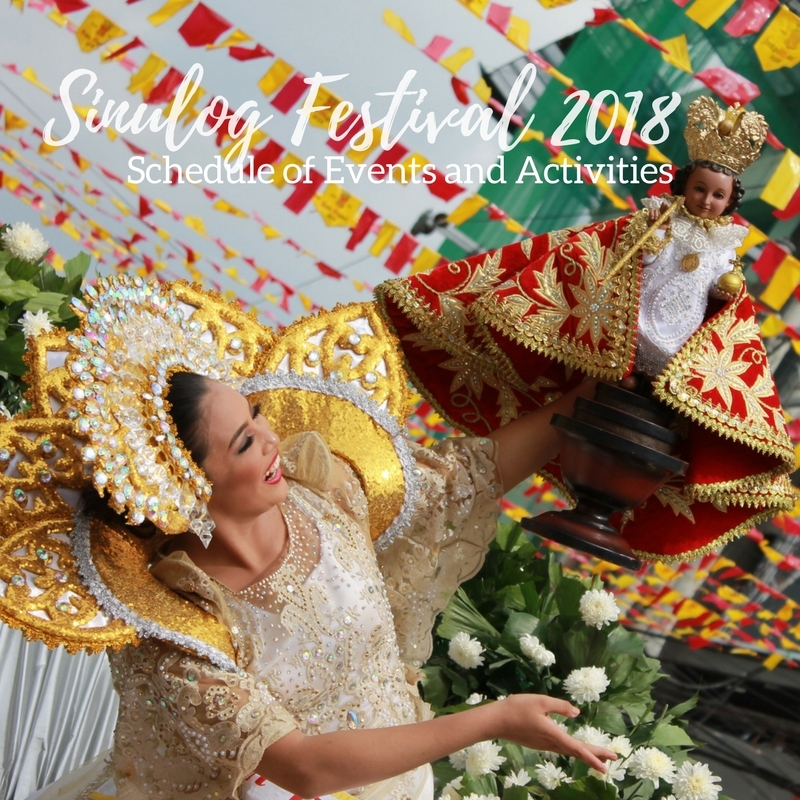 Sinulog Festival is held in commemoration of the reminiscence when Ferdinand Magellan handed the statue of the child Jesus Santo Niño de Cebú (Cebuano: Balaang Bata sa Sugbo, Filipino: Batang Banal ng Cebu, Spanish: Santo Niño de Cebú) as a baptismal gift to Rajah Humabon and his wife after being christened to Catholicism in 1521. This event stood to welcome the entry of Catholicism in the Philippines which rapidly spreadth all over the country. Historically, the original image of Santo Niño has brought so much mysterious blessings to the natives of Cebu in various instances. For the year 2018, the festival is scheduled to blast a bash on the 21st of January. With a theme “One Beat. One Dance, One Vision". The anticipated Grand Parade which takes 9-12 hours of the event will begin at the Basilica Minore Del Santo Nino, the current home of the original statue of the child Jesus. The Sinulog grand day is a big fun event, an all day celebration which will definitely rip off your energy which you wouldn't love so for you not to miss moments you are there for. So ideally, be in Cebu 2-3 days before the grand day and grab the chance to witness the city before it gets crowded on the day. However, being there in Cebu a week before the grand is more perfect since Sinulog sa Kabataan will kick off by then. If you've got no relatives or friends to stay into when you get there, it is a perfect thought of booking yourself in hotels the earliest possible you can to get away from the stress of fully booked accommodations. Sinulog is a big event so plenty of tourists and travellers are expected to be in. Beneficially, online booking is cheaper and hassle-free. Sinulog is literally a wet and colorful event so preferably wear the most comfy but not the classy and ostentatious clothing you have. The simplest and lightest decent clothes would do since it is a tradition of the locals to splash water and paints to the people in the event and also liquor rains when you get into the party. Major roads on January 21, during the Sinulog Festival Grand Parade will be closed to facilitate the whole event. The public and motorists are advised to take notifications of the traffic and road closures to avoid confusion. 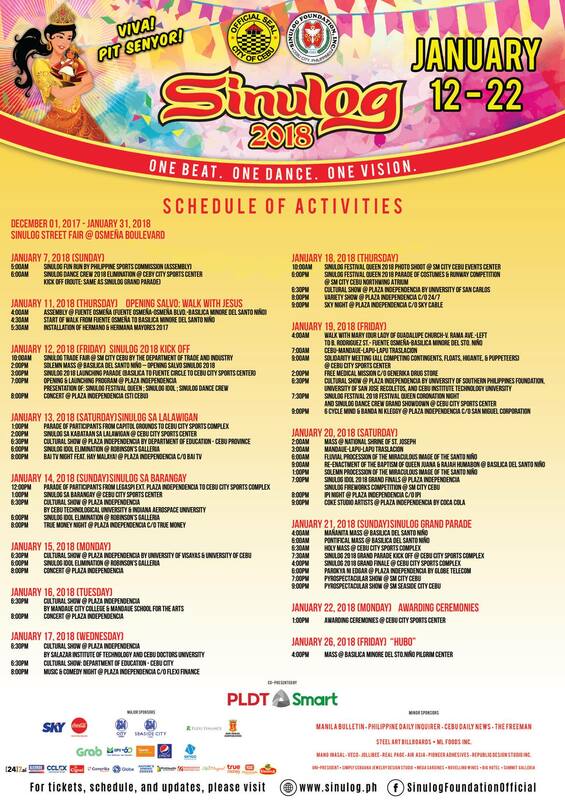 Official Schedule of Activities and Events released by Sinulog Foundation Inc. Check Sinulog Foundation Inc Official FB Page for recent Sinulog Festival news and updates. Hello! I will be traveling to cebu city that same day from Malapascua island, I didn't know about Sinulog until now, I was wondering if the traffic will be horrible getting into the city, my hotel will be near the ayala mall, I'm worried we will be stuck in traffic coming in.